My life has gotten extremely busy and complicated due to divorce proceedings, working, and other things, which gives me less time to write blog posts. For that reason, I've asked some friends of mine to contribute some guest posts, which I'll be including interspersed with mine. This one is from my friend Carly, hailing from Philadelphia. While I can't go vegan to save money because of my health issues (my stomach does not tolerate most vegan proteins), in the past I've incorporated many vegan dishes into my diet for precisely that reason, and found it a very useful tool. Frugal was not a word that I grew up understanding. I really never thought I would have to enter the word into my personal vernacular. Instead, I frequented coffee shops, ate out 2-3 times per week, and I only rarely had to think about spending (as long as it wasn’t frivolous). Now, we live on a budget, and our budgeting needs keep getting greater. First there was the kids. Then there was the house. Then something breaks. Then something else breaks. Tuition. Taxes. Grad school. Adulting. Most recently, my husband left his long-term full-time job working as a personal chef to start a food business. This is great, but it means that until he’s making enough money to support both our family and the business, our bootstraps are tighter than they’ve ever been. So, we’re living frugally. This means no extras: no spending money on babysitters, no going out to restaurants, and definitely no coffee shops. In fact, there’s even one more no that we’ve added to the list, with hopes to eat healthier and save money at the same time: we’ve gone vegan. Yes, you heard me right – The Nerdy Dad, who competes in barbeque competitions and sells spice rubs and sauces for meats, is married to someone who’s forced veganism on him, at least during the week. Now, don’t get me wrong, I admire vegans. I think that their dedication to the environment is praiseworthy. But I’m a meat and sweet-potatoes kind of girl, and my husband, well, he’s a really, really talented chef and food scientist. So, instead of seeing veganism as some sort of environmental calling, we’re seeing it as a challenge. A big one. The main course of each meal has to be vegetable based (with the exception of breakfast, because that’s just difficult). Weekends are off – which makes them a free-for-all of meat. Are we saving money? Yes! It’s basically slashed our food budget in half to eat this way – prior to our vegan experiment we were spending at least $250 on our groceries. Last week, we managed to spend just $75, by focusing on dried legumes and tofu for protein and vegetables from the produce stand. We even were able to “splurge” a little bit on vegan cheese and soy beef crumbles (which made really delicious tacos)! In terms of what we’ve been eating, we’ve made a lot of soups, including a really delicious pumpkin soup that we ate for an entire week. I even tried my hand at vegan mac and cheese, using vegetables for the base of the cheese sauce, which was a great success. But by-and-large, one meal has stolen the show: my husband’s tofu, which could fool even the most avid meat-eater. It requires a little bit of forethought, which we’ve learned all plant-based eating needs, but the reward is oh so tasty. 1. Drain and press tofu in between clean dish towels for 20 minutes-1 hour. 2. Rough chop the garlic, jalepenos, and onion. Combine the chopped vegetables with the rest of the ingredients (minus the tofu) in a large container and blend. You can do this in a blender, a food processor, or my favorite way, with an immersion blender. 3. Cube the pressed tofu into small bite-size pieces and fully submerge into the delicious marinade you just prepared. Let the tofu absorb this in place of all of the liquid you removed by pressing. 4. Let the tofu bathe in the marinade for at least 30 minutes, but with this — the longer, the better. You can leave it in there for up to 2 days. 5. 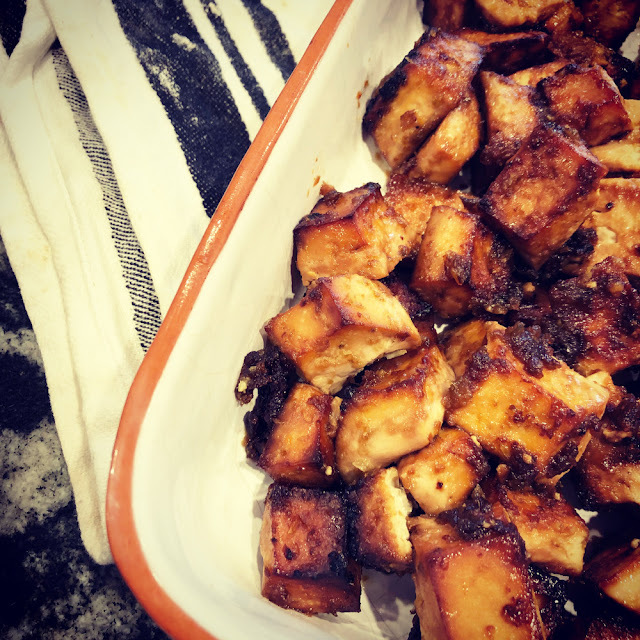 After marinating, place tofu in a single layer on a baking sheet with the marinade, and roast in a 400 degree oven for 50 minutes. It will be very soft and spongy as soon as it comes out, but as it cools it will firm up more. 6. Try not to eat it all as soon as it comes out, and enjoy tricking all of your meat-eating friends. Will we continue this vegan experiment forever? Probably not, but I think that we will incorporate more plant-based eating into our repertoire. Have you ever gone vegan or incorporated vegan recipes into your diet to save money? How have you found it affected your diet? Favorite vegan recipes to impress meat eaters? I found my favorite vegan recipe to impress meat eaters is homemade falafel balls, and it isn't too difficult to make either. I made this, it was very good. I also cooked down the leftover marinade,added a bit of cornstarch and used it as a sauce for stir fried vegetables.